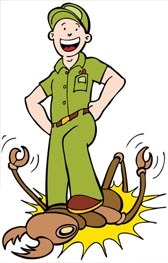 At Simcoe Pest Control (SPC), we offer weekly, bi-weekly and monthly pest control programs . We service retail, industrial, property management and food services. Our programs are designed around pest prevention and your spacific needs as your business relates! The most effective approach is an Intergrated Pest Management (IPM) program. It strategically examines your specific type of business and applies the safest and most effective methods used in todays environment. Should you be looking for a quote as a new business or an established business that may be unhappy with your present supplier, please give SPC the oppertunity to show you what we can offer. The last thing you need to worry about is pests invading your home. If and when it happens be assured that SPC can take care and make it go away! At SPC we offer a variety of pest control services. Some of those sevices include; one time treatments, Home Protection Programs, Spring and Fall treatments etc. We are Canadian owned, operated and proud!